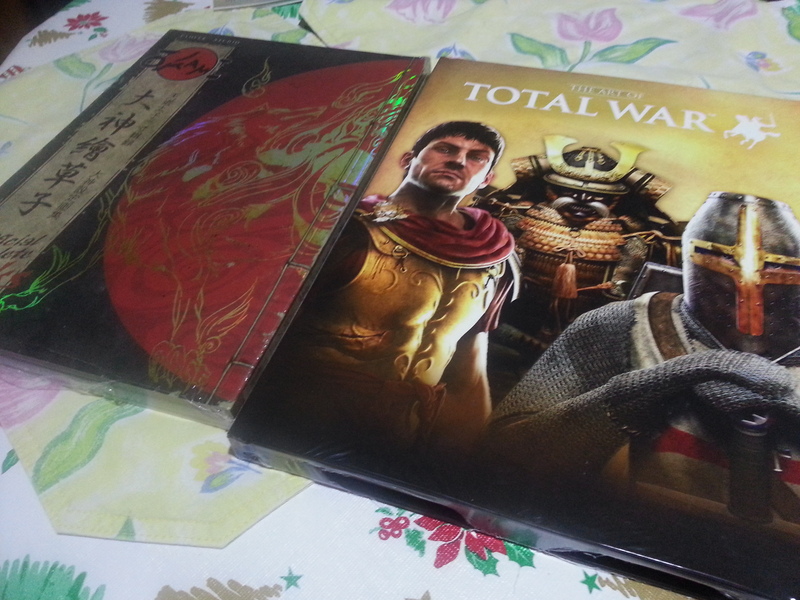 Two art books: The Art of Total War and Okami Official Complete Works. More photos to come! With Okami HD now out for PS3, this is a great time to showcase another one of my favourite songs from the game. Where the Shinshuu Fields were the hub for the game’s first half, the Ryoshima Coast is the hub for the second half; its beautiful music is the perfect match for its visuals. Enjoy! This week’s song is neither an opening nor a closing theme — it is, effectively, Okami‘s overworld theme. It’s the background music for the Shinshuu Fields, the “hub” area for the game’s first act, and much like the Morrowind theme from two weeks ago, its lilting, upbeat tones are the perfect thing to send you off on an adventure. Enjoy! As one Youtube commenter points out, I don’t recall the PS2 version of the game being anywhere near that blurry, but I’ll welcome anything that could bring such a great game to a wider audience (or even just ensure its availability for an HD platform).